In this day and age, we put a whole lot of labels on our media. If something is not considered fit for minors to view, we put a big "parental advisory" label on it. Heck, I've even seen some iTunes albums labeled specifically as "clean" (and I think it bit sad that we need to use that). At this point in time, I'm considering employing a "Caution: Mind-Blowing" for use with my personal hardcopy collection so that my children will know which to check out first in the event of my premature demise. Perhaps the only other album deserving of such a label this year has been Eden's Curse's Trinity, and the latest offering from German melodic power metallers Solar Fragment is giving them a bloody good run for their money. In Our Hands hit me like a wrecking ball sailing through a card house. I was so swept up in it at first that I was afraid to write a review for fear that I'd come off as a driveling fool. Now that I've mellowed a bit and let the album pickle my brain, I've finally come to my senses. This isn't like a religious epiphany or anything, but it may well be a contender for my favorite new release of 2011. I can't quite put my finger on what exactly tickles all the right receptors for me on this one. Is it the powerful, commanding vocals of Robert Leger?, the sublime guest vocals of Hansi Kursch on "Inside The Circle?" (Hansi singing about Darth Vader. You read that correctly. ), the occasional nautical themes?, or perhaps the occasional similarity (if only in my mind) to the most excellent Orden Ogan? Well, obviously I've got some explaining to do. 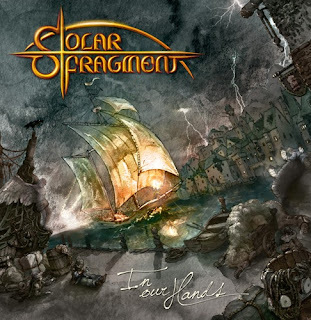 While Solar Fragment throws out some hyperspeed double-bass and guitar passages, they are more often a middle tempo power metal group that relies heavily upon Leger's potent voice to deliver the goods, and deliver he does. There is no end of hooky vocal lines on this album, and they're slathered generously over the entire cd like so much jam on toast, and like said toast, there's a whole lot of crunch lying beneath. Marc Peters and Manuel Wiegmann provide thoroughly proficient guitar work that performs terrifically as a cohesive force, adhering the driving rhythm section to the the soaring second-tenor range vocal parts. I compared this to Orden Ogan in terms of layered vocals and combined instrumental sound at times, but the feeling that the guys in Solar Fragment deliver is more modern feeling and less...organic perhaps, is the term. Leger is close to the Kursch/Jens Carlsson school of vocalists, but lacks the particularly sharp edge that gives these fellows their super-aggressive tones. Therefore, he's very well suited to this generally slower, more melodic and chunky form of power metal. Despite a few weak points (my general distaste for cursing means that despite the greatness of “Come Hell Or High Water”, I can't help but roll my eyes a bit. Taken in context however, the lyrics are a bit vile but not really out of place. ), In Our Hands is a supreme example of a band that, while still relatively young in terms of releases, is pulling everything together to make an excellent release. Nothing tips the balance too far in these songs, and they're persistently interesting and driving without ever resorting to filler material whatsoever. This is certainly not flowery power metal, Solar Fragment bring a very competent and sober broadside to bear. Hence, I can recommend In Our Hands to most anyone who finds bands like Blind Guardian, Excalion, and Orden Ogan to be the "more tolerable" side of a highly whimsical genre. I'll be gobbling up the group's first release in short order, and expect to see this splendid piece of work high on my personal list at the end of the year. This is a talented and formidable effort! There are no YouTube tracks off the new album yet, but I highly recommend a visit to the band's official website to sample all the great tunes!